As we sat down the sound of music came to my ears and our principle came out dressed as Beyonce and also dancing his way on the stage, I thought he was just dressing up to make us laugh but really he was actually ment to Beyonce. Now let me tell you about my favourite item, every item was fantastic and amazing but one of them really blew me away. Team 1 was the team that blew me away it was like an expectation vs reality type of video. Anyway the team 1 teachers made a movie and it was about what our expectation’s should look like, but Mrs Dwyer was doing the oppisite she was trying to show us what not to do. So basically what they are trying to tell us is to eat a healthy breakfast, exercise and also sleep early. I would just like to thank each and everyone of the teachers for giving up their time to prepare their movies an also to the team five teachers for their act. It was a great Immersion assembly it was one of my favourite's, all because of the teachers at Pt England School. 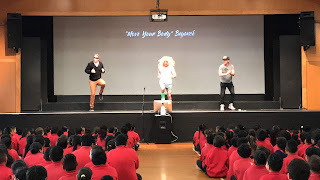 The Immersion Assembly last week was very good fun - Mr Burt dressed up as Beyonce and really did move his body while Mrs Dwyer made us think realise that playing playstation late into the night was not a good idea! I am looking forward to seeing more of your Maths and Literacy work on your blog in Term 3!